Important: You must be using the TCP/IP communications protocol to communicate with the TSM Server to use this interface. No other protocol is supported. Tivoli Storage Manager (TSM) is a complete data management solution for the unattended backup and recovery of a client/server network. Users can back up various platforms to the TSM Server while managing the distributed data centrally, allowing it to be used with most of today’s network environments. HelpSystems has worked with IBM to provide their IBM i customers with an interface to TSM using Robot Save. Customers use Robot Save as the TSM Client to save IBM i data to the TSM Server. Robot Save treats the TSM Server as an attached device, thus supporting all the common backup and recovery functions already built into Robot Save. Robot Save handles the saved data as if it had been saved to a physical volume, making the process transparent to the user. Note: After you install and set up TSM and Robot Save, keep these instructions in a safe place. They contain important information should you need to perform a complete system restoration. Each IBM i TSM Client is registered on the server as a node. Select a unique node name for each IBM i. We suggest that you select the system name of the IBM i. Note: Write down the node name and password entered during this step. A node has the required authority when the Archive Delete Allowed and Backup Delete Allowed options are both set to Yes. If these options are not set to Yes on a node, enter the following Tivoli command to change them to Yes. Do this on each node. where node_name is the node name of the IBM i you wrote down in the previous step. 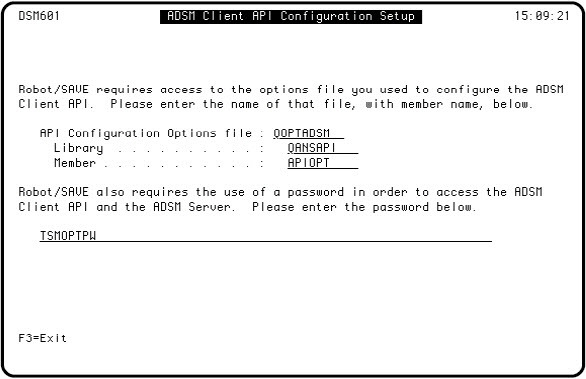 The ADSM Client API Configuration Setup panel displays. Fill in the name of the API Configuration Options file, and the library and member names. Enter the password specified during the TSM Server configuration. If you have any questions about the information that should be entered into the panel, contact your IBM representative. You are now ready to complete your Robot Save system setup and define a backup class and sets. Setting up Robot SAVE to use the TSM Server is the same as defining and using any other device, such as a tape device. Note: If you’re doing a new install of Robot Save, follow the instructions for system setup in the Robot Save User Guide. Specify Y in the Auto-initialize during save field. This allows Robot Save to initialize volumes automatically during the backup process. The following steps describe how to define the device, and create a backup class and backup sets when you use TSM. See the Robot Save User Guide if you need additional information about these panels. On the Robot Save Main Menu, select option 7, System Setup Menu. When the System Setup Menu displays, select option 1. 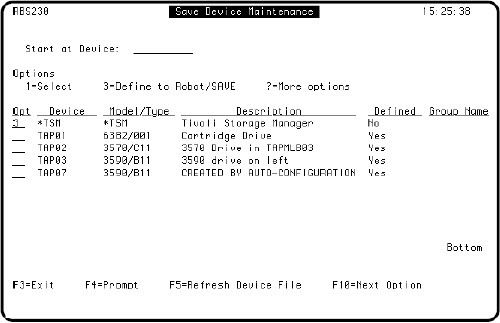 The Save Device Maintenance panel displays so you can define TSM as a device to Robot Save. Press F5 to refresh the display if the TSM device does not appear on the panel. Enter a 3 next to the device *TSM to define it to Robot Save. You must define the device to Robot Save before you can select it in a backup set. You cannot change the name or other device information for TSM. On the Automated Backup Setup Menu, select option 1, Maintain Backup Classes and Sets. When the Backup Class Maintenance panel displays, press F6 to add a new backup class for the TSM Server. 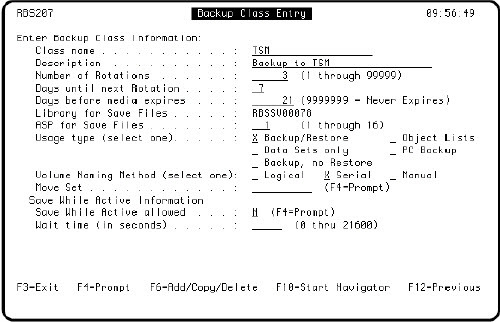 The Backup Class Entry panel displays. Note: Usage types PC Backup and Data Sets only are not valid for TSM backups. Enter the name and a brief description of the backup class and specify the rotation information. Select the Usage type for the backup class. You can select a usage type of Backup/Restore, Objects Lists, or Backup, no Restore. Select the volume naming method for the backup class. We suggest you use either serial or logical naming. Manual naming is not recommended. See the Robot Save User Guide for a complete discussion on entering backup class information. Once your backup class has been defined, you can set up backup sets that specify the libraries or objects to be saved. On the Backup Class Maintenance panel, enter a 2 next to the backup class you just created. When the Backup Set Definition Maintenance panel displays, press F6 to define a backup set. The Backup Set Information panel displays. Complete the panel with the information for the backup set. Specify the name and a brief description of the backup set. For a complete discussion of the fields on the Backup Set Information panel, see the Robot Save User Guide. 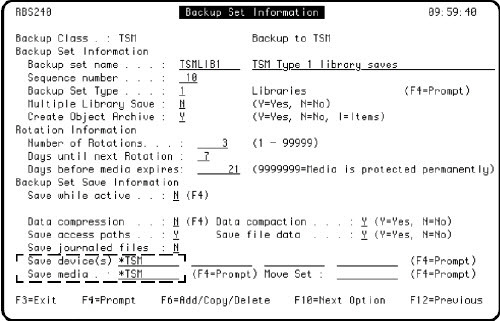 Note: You must specify *TSM as the Save device for the backup set. You can enter *TSM in the Save device field and Save media fields. You cannot specify any other device names. Define as many backup sets as you need within your backup class. For example, you could have a backup set to save an object list, or another backup set that saves folders and documents. When you have finished defining your backup sets, you can schedule the backup on Robot Schedule, the job scheduler, or run the save from the Robot Save Operations Menu. See the Robot Save User Guide for complete information on executing a Robot Save backup. To restore a library or object from the TSM Server, you follow the same procedures as you do to restore from any save device. See the Robot Save User Guide for a complete discussion on restoring libraries or objects. However, if you use the TSM Server as your backup device, there are some special considerations when you need to perform a complete system restoration. Use the following checklist to restore your system properly. Find the last Restoration Procedures Report printed by Robot Save. Mount the first tape of the SAVSYS on the tape drive. The restoration report tells you the volumes to use. Turn on the console. See the instructions for installing or restoring Licensed Internal Code (microcode) in IBM’s Backup and Recovery Guide. Do an IPL using the SAVSYS volumes. You will need to do a special restore of the IBM i operating system using the SAVSYS volumes. See the detailed instructions in IBM’s Backup and Recovery Guide. Sign on as security officer on the console. Note: If you are using the TSM software, your restoration report contains special instructions. Before continuing with the restoration, install and configure the TSM Client APIs. This makes TSM available as a restore device. If you have questions, contact your IBM representative. Restore the special Robot Save TSM commands from the volume listed on your restoration report. If no volume is listed, use the media sent to you by HelpSystems. Run the DSMCFGAPI command to configure the TSM Client software. Enter the information asked for on the panel. Continue with the system restoration instructions. Note: During the restoration, you may need to restore data from the TSM Server. When you restore data from the TSM Server, you must first restore a save file, then restore your data from that save file. The commands you need to perform a restoration from the TSM Server are printed in the restoration report for every library or object that has been saved to the TSM Server. After you have restored your data, you can delete the save file. Mount the volumes indicated on the restoration report for the restore user profile data. Enter the restore user profile data command as indicated on the restoration report. Mount the volumes indicated on the restoration report for the restore configuration data. Enter the restore configuration data command as indicated on the restoration report. Restore the Robot Save data library RBSDTALIB. Mount the volumes indicated and enter the restore command that is on the restoration report. Restore the Robot Save program library RBSPGMLIB. You may have to restore the library and then restore the changes to the library. Mount the volumes indicated and enter the restore commands that are on the restoration report. Restore the library RBTSYSLIB. Mount the volumes indicated and enter the restore command that is on the restoration report. Add RBTSYSLIB to the system portion of your library list. Use the CHGSYSLIBL command to do this. Add RBSPGMLIB and RBSDTALIB to your library list. Execute the command RBSRSTSAVF. This restores the data necessary to access the save files on your ASP. The data is stored in library RBSDTALIB. If you're restoring your system at a hot site whose system name differs from your regular system name, run the RSLCHGSYSN (Change System Name in Files) command to rename the system in Robot Save’s files for the restoration process. Skip steps 15 though 17 and proceed with step 18. Enter the command RBS to access the Robot Save Main Menu. Select option 5 to go to the Automated Backup Setup Menu. On the Automated Backup Setup Menu, select option 4 to display the Guided System Restoration Procedures panel. Press F21 to select system restoration. Robot Save tells you which volumes to mount and then restores the libraries automatically until all the libraries and their changes are restored. When each library is restored, it is marked "RESTORED." If any volumes are not available, enter option 2 next to the library for alternate volumes to use. If those are not available, go to the Library Archive Inquiry panel to find the latest available volumes for that library. Restore the library from those volumes. Or, select QDOC from the Robot Save Guided System Restoration Procedures panel. If you save the Integrated File System (IFS), use the RST command to restore IFS files. If some objects were created after you did your last save of user profile security data, the ownership of the objects is transferred to the system default owner. You can fix this problem by executing the command for each library which has this problem. When you execute this command, Robot Save finds the object archive entry for each object in the library and changes the ownership to the object owner as of the last object save. This should take care of any lost owner problems. If you are using journaling, you will need to apply your journal receivers from the last time Robot SAVE did a save of the file. Run the DSPJRN command on the file to find out when the file was last saved. The next sequence number should be placed on the parameter FROMENT of the command APYJRNCHG. Use *LAST for the ending sequence number. Similarly, apply the journal receivers to all the appropriate files in your libraries. When you have finished and everything looks normal, do a PWRDWNSYS *IMMED RESTART(*YES). Robot Save PC backups are not supported. The RBSRECORD command is not supported. Data Sets are not supported. The IBM i cannot be in a restricted state because the TSM software runs in its own subsystem. Robot Save supports all of these backups when you are saving to another device type, such as a tape drive. See the Robot Save User Guide for a complete discussion of how to back up your IBM i using Robot Save.